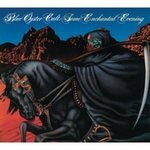 "Some Enchanted Evening" by Blue Öyster Cult, Murray Krugman et al. “Some Enchanted Evening is such a fine document of the band on form that its major fault lies in not being a double (disc)” – Max Bell, New Musical Express, quoted at www.blueoystercult.com Disc 1. R.U. ready 2 rock -- E.T.I. (Extra terrestrial intelligence) -- Astronomy -- Kick out the jams -- Godzilla -- (Don't fear) The reaper -- We gotta get out of this place -- ME 262 -- Harvester of eyes -- Hot rails to hell -- (This ain't the) Summer of love -- 5 guitars -- Born to be wild -- We gotta get out of this place (alternate version). RIAA Certified Platinum. Tracks 1-7 of the compact disc previously released in 1978; includes previously unreleased bonus tracks 8-14. Murray Krugman co-produced with Sandy Pearlman. Original recording: 1978. Compact disc. Performer(s): Rock songs, performed by Blue Öyster Cult. Event notes: Recorded live in various locations in 1978. Purchase link is for 1997 edition, excluding bonus tracks 8-14. Blue Öyster Cult (Musical group). (2007). Some enchanted evening. New York: Columbia/Legacy.